This book teaches marketers how to engage and listen to buyers, and how to use what they learn to improve their offerings in today’s Internet- and social media-driven marketing environment. It brings traditional marketing coverage up-to-date with a thorough, incisive look at e-marketing planning and marketing mix tactics from a strategic and tactical perspective. The focus is on the Internet and other technologies that have had a profound effect on how marketing is approached today. Included is coverage of marketing planning; legal and global environments; e-marketing strategy; and marketing mix and customer relationship management strategy and implementation issues. 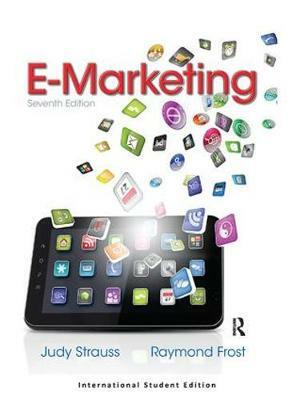 Better understanding of new concepts in today’s electronic marketplace is accomplished as the book puts that new terminology into traditional marketing frameworks. Readers are encouraged to exercise critical thinking and attention to their own online behavior in order to better understanding the e-marketer’s perspective, strategies, and tactics–to think like a marketer. -Review and discussion questions are another device to be used for refreshing readers’ understanding of the material in the chapter. NEW. Students get a broader look at social media as it is now integrated throughout the book, instead of confined to one chapter. NEW. A look a new business models continues and strengthens the approach of learning from real life examples. Added and described in detail are such models as social commerce (and Facebook commerce), mobile commerce and mobile marketing, social CRM, crowsourcing, and many important be less pervasive models such as crowfunding, freemium, and flash sales. NEW.Chapters 12, 13 and 14 were completely rewritten to reflect the move from traditional marketing communication tools to the way practitioners current describe IMC online: owned, paid and earned media. NEW. Readers see examples of many new and interesting technologies that are today providing marketing opportunities, both in the Web 2.0 and 3.0 sections. NEW. The chapter-opening vignettes continue to play an important role in illustrating key points. Two new vignettes and new discussion questions about each chapter opening vignette are included. NEW.Included are many new images in every chapter, plus updated “Let’s Get Technical” boxes.